Photo courtesy of Dr. Vicki Morris. Dr. Vicki Morris (in pink scrubs third from left) waits with others in the nurses’ station case management center. Dr. Vicki Morris just finished volunteering in one of the last places on earth anyone would want to be right now: an Ebola treatment center in rural Liberia. Morris wasn’t ready to leave even though she knew the situation was getting dangerous. “That was just heartbreaking to me … I felt like we were abandoning our nurses, we were abandoning our patients and we didn’t know who was coming in to take over, if anybody,” she said. She has learned since that Doctors Without Borders took over the center. Morris, a member of Soapstone United Methodist Church in Raleigh, North Carolina, and an infectious disease specialist, was in Foya, Liberia, from July 5-Aug.1, working with Samaritan’s Purse. The nondenominational Christian organization runs a center close to the Guinea border where the Ebola outbreak started in May. She planned to be there six weeks but was evacuated after only three weeks because of the beginning of civil unrest, which has led President Ellen Johnson Sirleaf to quarantine neighborhoods and impose a curfew. Morris called Bishop Hope Morgan Ward after she returned to the U.S. 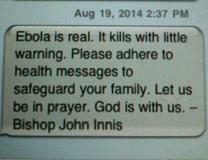 In a video, the North Carolina bishop appealed to the church to give gifts to the United Methodist Committee on Relief to fight the Ebola outbreak. 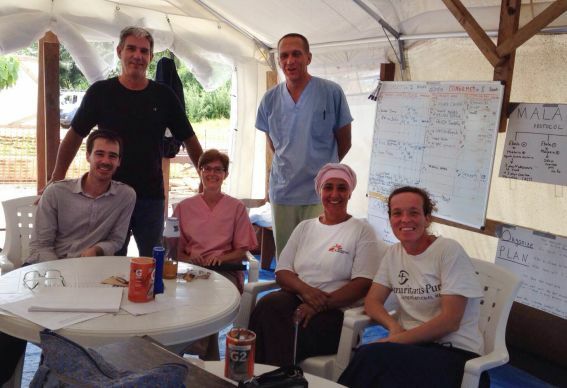 Morris worked with Liberian doctors and nurses as well as other volunteers from Samaritan’s Purse. Groups from the center went into the communities daily to educate people about Ebola and one group was attacked. The center had from 20 to 30 patients at the time she was evacuated. Those samples were sent to a laboratory in Guinea. She said she is still on the email list and gets notices when samples go out from Foya, so she knows cases are still coming in. The nurses and health care professionals are still at the center, still treating patients, she said. “Samaritan’s Purse pulled out. The nurses could have run away but they didn’t, they stayed to take care of the patients. Morris said the Ebola patients themselves helped care for each other, especially looking out for children who came to the center alone. Some of the children had parents who had died or were too sick to care for them. Some had healthy parents who had to stay outside of the center. She agrees with Ken Isaacs, director of Samaritan’s Purse, who testified before Congress on Aug.7 that the reported cases of Ebola only represent 25 percent to 50 percent of the actual cases. Morris said she is concerned about Liberia and feels some type of military response is needed as a humanitarian mission to at least get in supplies and provide security. Morris is glad the attention of the world is on West Africa and this Ebola outbreak. Morris said the experience changed her and she is still thinking and praying about what she is supposed to do next. *Gilbert is a multimedia news reporter for United Methodist News Service. Contact her at (615) 742-5470 or newsdesk@umcom.org.